Don Quixote mixes rosemary in his miraculous balm of Fierabras (Part One, Chapter XVII). Rosemary is a woody perennial, evergreen shrub, native to the Mediterraneans and Asia. It is hardy in temperate regions and requires frost protection in cooler areas. Besides this rosemary is drought tolerant and can become very old under favorable conditions. It has an upright or trailing growth. The small flowers come in white, pale pink to purple or light blue flowers. The leaves are colored green on top and white underneath and are covered in dense short woolly hair. The whole herb is aromatic. The leaves, dried or fresh, are used for flavoring food, e.g. potatoes. The essential oil contains various phyto-chemicals, including rosmarinic acid, camphor, caffeic acid, ursolic acid, betulinic acid, and the antioxidants carnosic acid and carnosol. It used medicinally and in perfumes. Magical Uses: For cleansing a room, sprinkle the area with a bundle of mint, marjoram and rosemary twigs, which have been dipped in salt-water. Burn rosemary as a cleansing incense before any magical operation. Rosemary placed beneath the pillow ensures sound sleep and protects from nightmares. Hence it is also added to dream pillows. Placed beneath the bed it protects from all harm. It is hung above doorsteps to protect the house from thieves and carried to remain healthy. An infusion is used to wash the hands before healing work. Add to the bath water for a purifying and rejuvenating bath. A rosary made from the wood, aids memory. Burn the leaves for knowledge and receiving answers to questions. Smelling the wood preserves youthfulness. Healing poppets are stuffed with rosemary herb. Burn with Juniper berries to purify the room and aid healing. The crushed leaves wrapped in white linen are bound around the right arm to dispel depression and lift the mood. 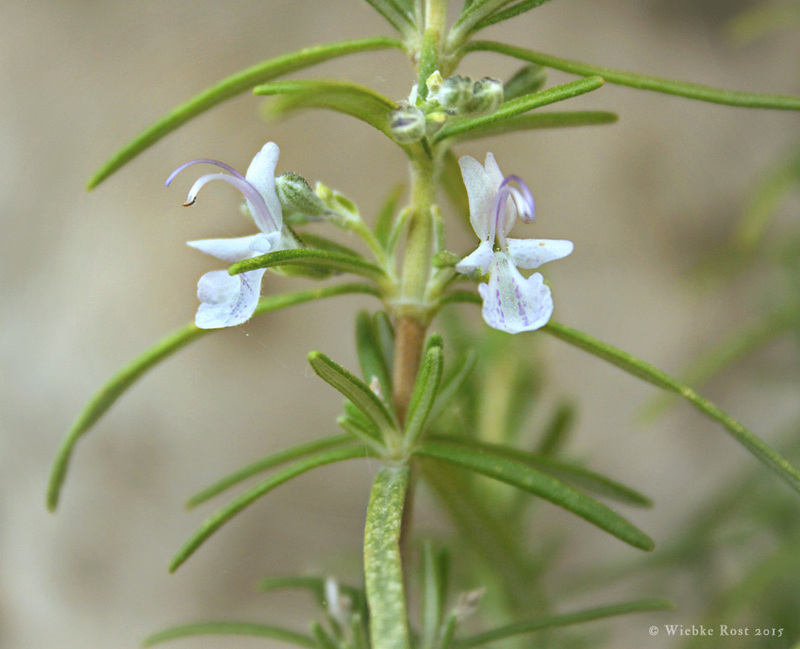 Rosemary is also a traditional ingredient in love and lust spells, e.g. it is part of incense or oils used in such context. Rosemary is also used as a substitute for Frankincense. Propagation and plant care: Sow under glass or transparent foil, cover with a thin layer of soil (double the thickness of one seed) and keep in a warm spot. The seeds germinate within 15-30 days. The germination time can be reduced with the help of gibberellic acid. The young plants grow slow and should be over-wintered indoors and planted out the second year, after adopting them successively to cooler temperatures.